ell, I’m focusing on the details this week while waiting on the final range hood installation, open shelving, pantry counters and the painters. The round linen-covered tables were a little high next to my loveseat, and the copper urns were just a little tall. I’m taking them to the new Mountain house renovation. I brought these two smaller rectangular tables in to try. The one on the left is a ‘cocktail’ table with a candlestick lamp from Boxwoods–Atlanta. 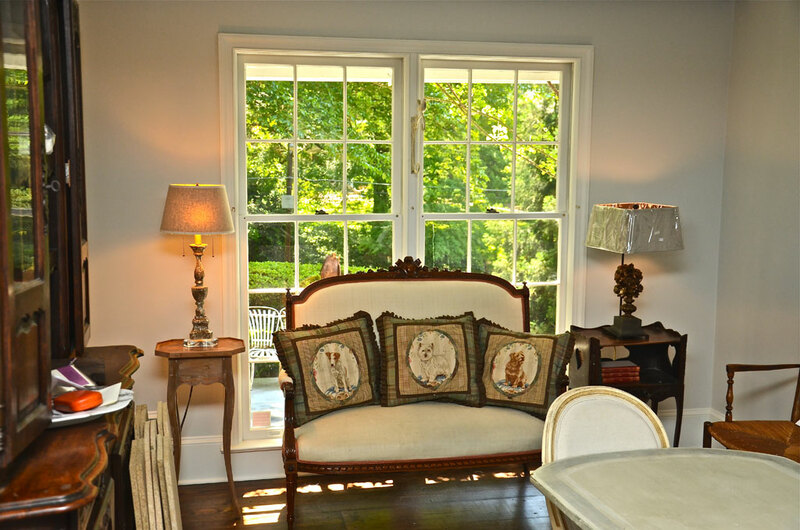 The one on the right is one of my own antique tables with a floral urn lamp on top–also from Boxwoods–Atlanta. I know, I have a Boxwoods problem. Do you have a favorite? The round linen-covered tables with the Belgian coffee urns–just too tall. I was going to make the urns into lamps–they would touch the ceiling! The 'Cocktail' table and candlestick lamp on the left–very slim and beautiful. This table can hold the lamp and a drink. 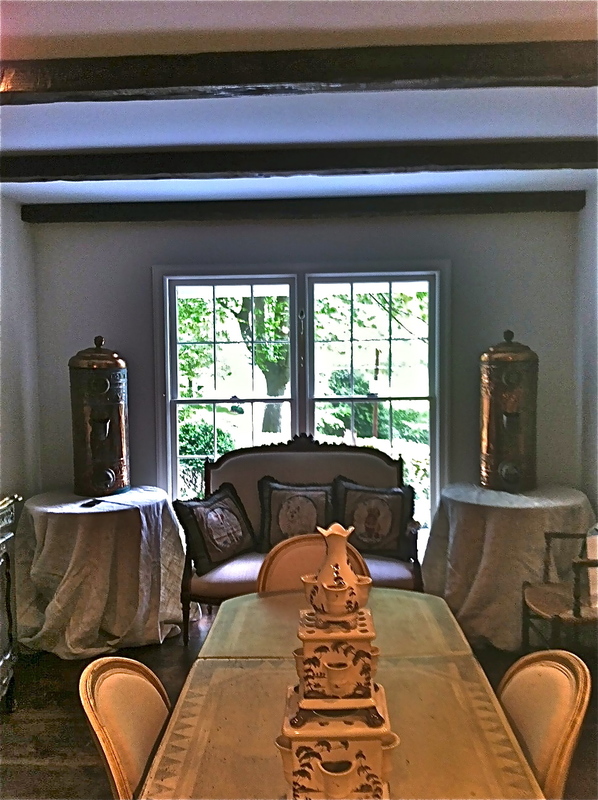 The antique table and urn lamp on the right–a little larger with a lower shelf. Looks great! Have you decided to keep these lamps and tables? The lamp on the left is out–the one on the right is still in the running. a “good thing”? ~ in place of little table with lamp that looks tenuously perched. . .
Billy loved the small table–but it is too small. It is all going back. 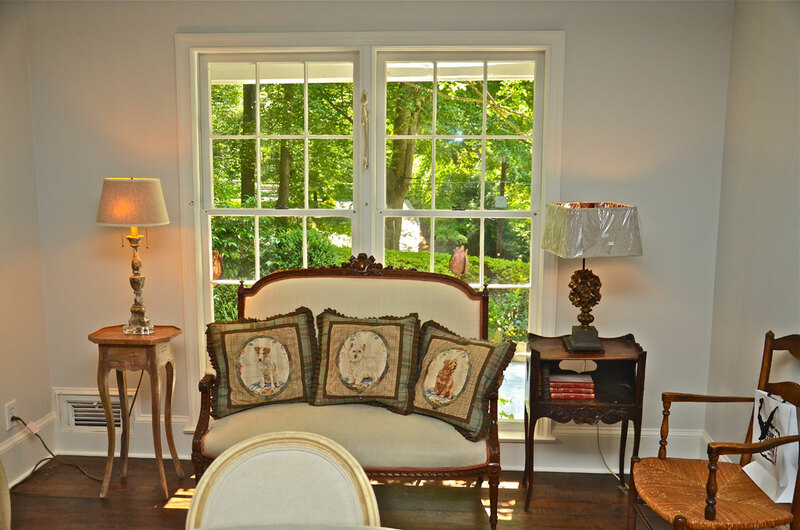 The window will get draperies and the table lamp is a good idea. Too big and Too small–maybe the next will be just right. Most of it was on approval. I would put a small chest on the facing right side ….one that would go all the way to the corner but not too deep. You could put the candle stick lamp and a small tea set (I know that you have one) if the lamp proportion is not too tall. On the facing left side you could use a dropleaf table or a two shelf small server. With tables and chairs you already have lots of legs, so not too large but solid pieces will look good. The chest and server would give you extra storage. The round tables were too large but the urns will be fabulous in your Mt Home with the vaulted ceilings. You could have stands made for them and use them like floor lamps. I just ordered a book from England called Perfect Palettes by Stephanie Hoppen thru Amazon. It is all about paint colors and is really good. You might enjoy using it for the Mt. Home. Thanks Caroline! There are two of the urn lamps–they are on approval. I will move on to the next. I just looked again and a dropleaf table would not block the AC duct. Thanks! A drop leaf would be great. Billy loved the small table–too small. Love all of your ideas. Lissy, I love Caroline’s idea (above) of a small chest. She’s right, it would take care of things being leggy. And I also agree that a drop leaf side table would be useful. On the other hand, your kitchen is very interesting because it’s not symmetric. You could stand a “pair” of something if you found two. I really loved the softness of the fabric when you had the round tables with tablecloths. What about a pair of rectangular tables with a box pleated table cloth? The kitchen is so pretty—and you are the master, so I know you’ll come up with a great look. Thanks for asking for our input, because as you can see, we’re all interested in seeing this stunning kitchen fully appointed. Thanks! You must be reading my mind–i need rectangles without legs. This has been the most fun of a fun day. I love all the comments and choices. You are a good sport, Lissy. Don’t let those urns go under any circumstances, either in Atlanta or the mountains. They are just wonderful. I like Caroline’s suggestions very much. I am a fabric person, so I would love to see that wonderful settee framed by some tie back draperies to soften the room. When I get around to re-doing the manse here I am going to put it online with you all; great ideas. Thank you Carolyn! I am adding draperies and more fabric–check back for the results.